(Cambridge, MA) It’s been a good few years for female scientists. Sally Ride came out posthumously in 2012. Hidden Figures rocked the box office in 2016/2017. Dorothy Vaughan, Mary Jackson, Katherine Goble/Johnson and the other human computers are finally receiving their due accolades. Women are entering STEM fields at increasing rates. Local company, Flat Earth Theatre produced Lauren Gunderson’s Silent Sky in March 2017. 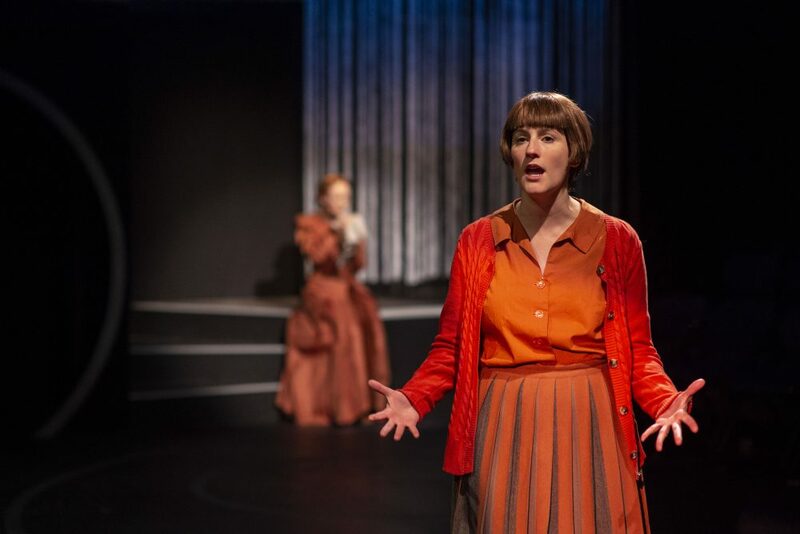 The Nora Theatre Company is playing The Women Who Mapped the Stars right now. There are many more successes, but it won’t be enough until women and other minorities receive the equal success as men. 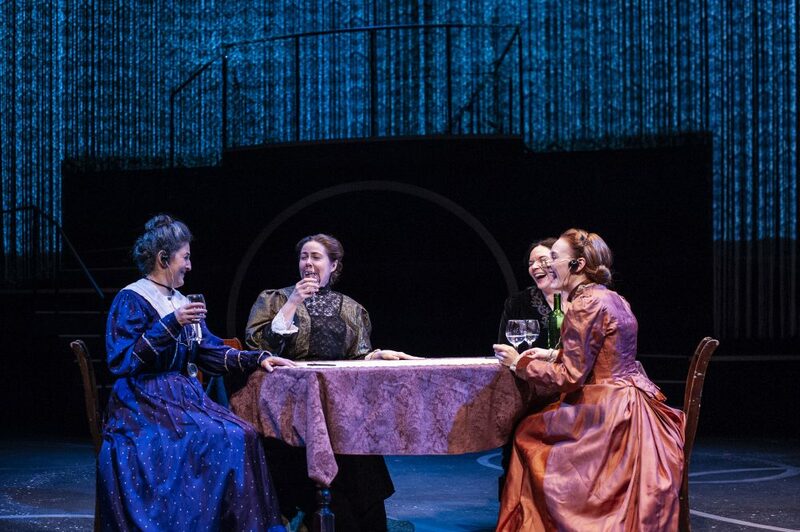 The Women Who Mapped the Stars opens as young, pregnant, Scottish immigrant, Williamina Fleming (Becca A. Lewis) is abandoned by her spineless husband. Through ceaseless hard work, Fleming becomes an astronomer processing raw mathematical data at the Harvard Observatory. She, Henrietta Swan Leavitt (Sarah Oakes Muirhead), Antonia Maury (Christine Power), and Annie Jump Cannon (Sarah Newhouse) are the women who discovered new corners of the night sky while men took the credit. TWWMTS is partially narrated by scientist Cecilia Payne (Amanda Collins). Payne is determined to continue their work despite academic dismissal at every turn. Regardless of gendered setbacks, these women pioneered the stars. TWWMTS is awe-inspiring. The cast does brilliant work with the script. Jessica Ernst has packaged this play in love and respect. We’re told that it’s currently in workshop mode but I honestly didn’t see much that needed revision. An occasional tweak for preference might be made, but the dialogue is strong; we’re given lush, relatable characters; the science is convincing. It’s a great piece of theatre that could work in a large or intimate venue. It could even travel, if a theatre so chose. The projection design by SeifAllah Salotto-Cristobal is rough around the edges. It’s inconsistent with the other design elements of the production. These other elements are so seamless as to fade into yet assist the action on stage. The dramaturgy work by Dean Marchant is informative. The program essay helpfully reminds audience members of the rampant misogyny in astronomy. Marchant’s writing is directly relevant to modern times. Interested patrons will be excited to know that Central Square Theater is hosting a series of talkbacks with area scholars. These are free and open to the public but will make more sense if one attends the performance. Behind every great man there might be a woman, but behind every great woman there are a legion of women who paved her way. The Woman Who Mapped the Stars is unrelentingly feminist, historically accurate and a great way to spend an evening. It passes the Bechdel and Mako Mori tests. This entry was posted in Drama and tagged 2018, A.R. Sinclair Photography, April, Bechdel test, Cambridge, Central Square Theater, Dean Marchant, Dorothy Vaughan, Flat Earth Theatre, Hidden Figures, Jessica Ernst, Joyce Van Dyke, Katherine Goble/Johnson, MA, Mako Mori Test, Mary Jackson, May, Sally Ride, Silent Sky, The Nora Theatre Company, The Women Who Mapped the Stars by Kitty Drexel. Bookmark the permalink.